Experience the magic of Disney as never before with its most successful live orchestral show, Disney on Classic ~ A Magical Night! Following 12 years of sold-out performances in Japan, Disney on Classic ~ A Magical Night is finally arriving in Southeast Asia and Singapore for the first time for the whole family to enjoy. 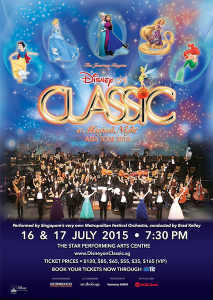 This full length concert will showcase the most beloved tunes from the famed Walt Disney Studios songbook, performed by 8 international vocalists and Singapore’s very own Metropolitan Festival Orchestra under the baton of legendary Disney music maestro, Brad Kelley. Favourite Disney memories come alive during the performance with original movie footage projected overhead on a large cinematic screen, and specially designed lighting and staging effects for that extra sprinkling of magic! Featuring the timeless music and scenes from Disney’s Snow White, Cinderella, Pirates of the Caribbean: The Curse of the Black Pearl, The Little Mermaid, Tangled and Frozen, don’t miss this magical treat to relive the treasured Disney moments we have all loved for a lifetime. An unforgettable and unique experience for Disney fans of all ages!